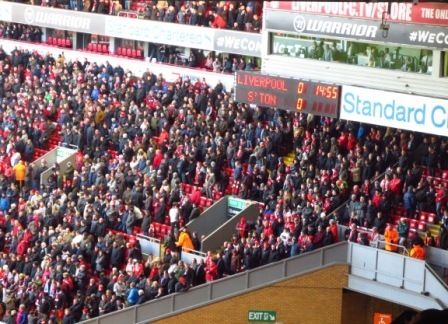 Good classic electronic scoreboard here at Liverpool. Straightforward and simple. You’ve got the teams, scores and time, and this type of digital display doesn’t allow for sponsor messages. 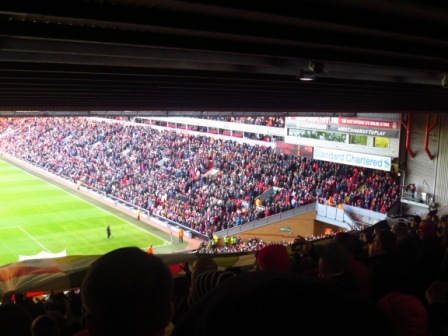 It’s hardly prominent, tucked away up there facing the Kop Stand (in which I stood), and it’s surprising that a big club like Liverpool has no big screen when many of the top 20 or 30 clubs in England have them. 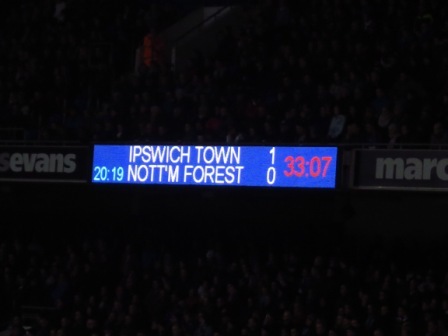 I didn’t get a photo of, nor could I properly see, the main scoreboard at Portman Road, Ipswich Town. 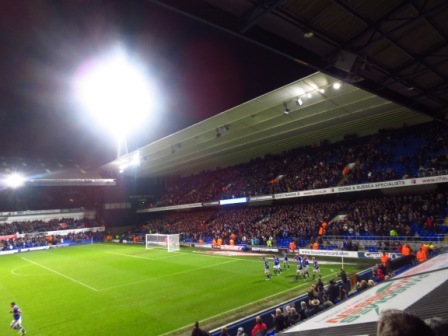 It’s a big-screen in the corner between the Cobbold and Sir Alf Ramsey stands (I was in the Cobbold). The scoreboard that I did photograph is too bright to see in the wide shot (below), and makes everything else too dark to see in the close-up! But there you are, that’s the way it goes. 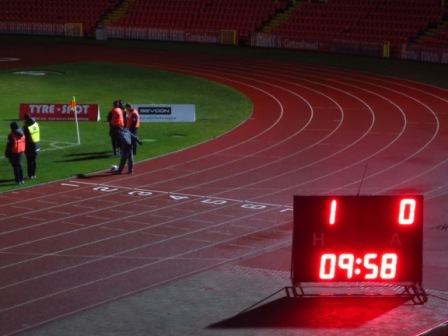 The digital red numbers at Gateshead glowed bright in peripheral vision in the darkness, with the scoreboard directed towards the few hundred spectators there on a cold Tuesday night. Notably the clock counted downwards from 45:00. 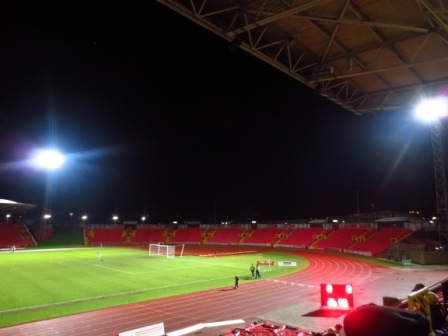 A cold, quiet evening at Gateshead. Jesse Maskell is currently in Europe courtesy of a Scoreboard Pressure International Internship. ← Scoreboard Pressure on national airwaves.